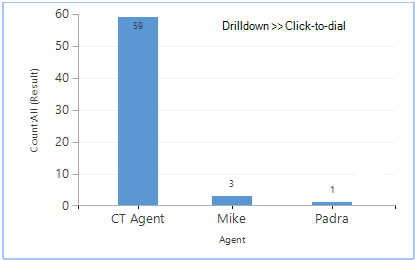 Work Time Analysis: Totals based on the individual call records for each agent, covering time-in-state for Talk, Hold, Idle, Pause, Ringing, Wrap, etc. Call Outcome Analysis: totals based on the individual call records for each agent. Outcomes include inbound, outbound, click-to-dial, No Answer, Busy, Voicemail, Bad numbers, Yes, No, Defer etc. Plus, any custom outcomes you add to Dynamics Telephony are automatically included in this dashboard. You could make a copy of a standard dashboard to display only the data you want. When viewing the standard dashboard, click Save As in the ribbon. 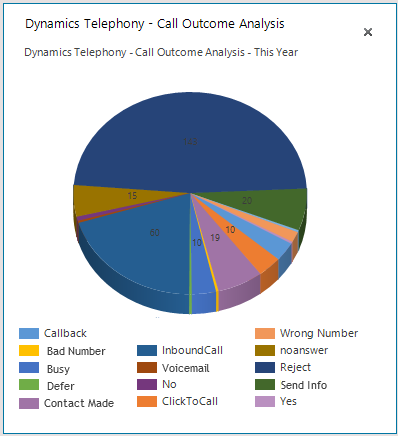 The call-by-call view in CRM shows every inbound and outbound call. Click on the image for full view.